Congratulations to Brian, Bruce, Clay, Evan and Penny! Each of them will receive a beautiful (and shiny!) glass statue, along with a 5000 USD cash prize in support of their Open Source development efforts. 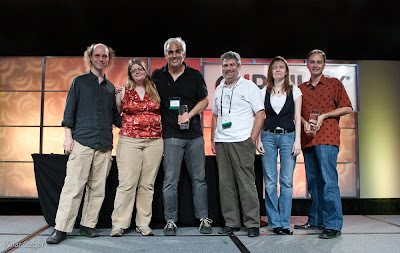 The awards are just one part of Google's participation in OSCON 2009. If you're around, come find us, introduce yourself and share your thoughts on all things Open Source.